You can derive great satisfaction in caring for yourself and your family using natural remedies. At its very root, there are similarities between the organic chemistry of remedy-making and cooking! The same principles and skills apply. At Nature’s Lab® we aim to provide you with the right tools for success in home remedy preparation. We recommend using the best quality ingredients, some of which will be made available to you via our online store in the near future. We also recommend practising absolute cleanliness and following instructions carefully. 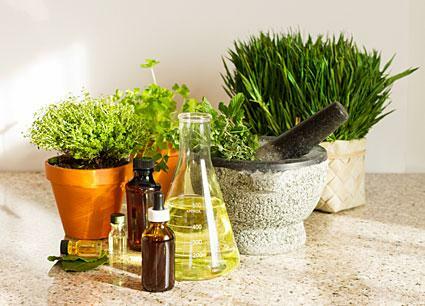 When preparing home remedies, it is important to note that several herbs may be recommended for a particular ailment. For example, would rose, lavender, rosemary or chamomile be best for your headache? Knowledge of the herb, the individual, and the different methods must be combined to prescribe remedies that will be really effective. Consider the whole body and person first. Is medication needed? Consider a change of rest, diet, or exercise before prescribing the patient any remedy. Use simple remedies internally and externally. This will encourage the body to heal itself. Make a list. Know what you are taking and what to expect. Keep a note of all remedies taken. This will be useful if you need help later. Take as recommended. Stick to the standard dosages. Doubling does not double effectiveness, rather it may put an extra burden on a body that is already sick. Apply lots of tender, loving care. A positive and loving attitude may help speed up the healing process. Monitor progress after a few days and in a periodical fashion. Stop treatment if there is any adverse reaction. Be alert, especially in the case of children. Seek professional help if in any doubt. You may need an objective eye in order to assess your own symptoms more accurately. Dried herbs are available from herb stores and some wholefood outlets. Always specify the herb and the part of the plant to be used – root, bark, leaf, or flower. Herbal products, remedies, tinctures, tablets, etc. are available from wholefood stores and some pharmacies. Read the label and instructions carefully. Water – Infusions (teas). Nature’s Lab® experts recommend teas for flowers, leaves, some seeds and fruit. Herbs taken in tea form are quickly assimilated and utilized by the body. It is also gentle for children and those with a delicate digestion. Alcohol – Tinctures. Nature’s Lab® experts recommend tinctures for all plant parts, especially hard parts like roots. Alcohol adds some temporary heat and stimulation. It is convenient, although not for those intolerant of alcohol or for babies. One advantage is that tinctures keep indefinitely. Oil – Herbs infused in oil. Nature’s Lab® experts recommend oil-based berbal infusions for all plant parts. These are suitable for rubs, massage oils, and liniments. Infused oils can be thickened with beeswax to make soothing and nourishing ointments and salves. For those who are interested in finding out more about herbal home remedies, contact our experts at Nature’s Lab® for a free email consultation.